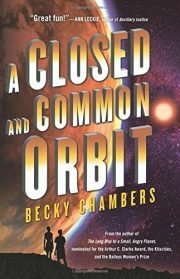 2016’s Hugo nominee A Closed and Common Orbit is the second novel in Becky Chambers’ Wayfarers series. Forced by circumstance to abandon her life as the mind of a starship, artificial intelligence Lovelace is re-homed in an android body. She adopts a new identity as Sidra. Life in a humanoid shell, tottering precariously on two legs and dealing with complex, unfamiliar social protocols, is challenging. She meets Pepper, who is eager to help Sidra learn to cope. Unlike many others, Pepper believes that artificial intelligences are people. Why does Pepper have this peculiar and economically inconvenient belief? The answer to that lies twenty years in the past. 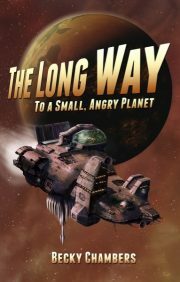 2014’s The Long Way to a Small, Angry Planet is Becky Chambers debut novel. It’s basically what you’d get if you took Firefly (minus the unfortunate Civil War metaphors) or an average campaign of the Traveller RPG and focused more on interpersonal dynamics and character’s emotional lives, while substantially reducing the level of violence. Traveller was the first table top RPG I played extensively and I still remember it fondly. 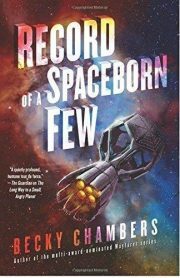 Yes, this book reminds me of Traveller; it even begins with an event that could very well be someone failing their low passage roll . That said, while I see the similarities that Heron61 mentions, I was more strongly reminded of James Tiptree, Jr.’s short story “And I Awoke and Found Me Here on the Cold Hill’s Side” … that is, if James Tiptree, Jr. instead of being relentlessly, inexorably depressing, had been a cheerful optimist. The book isn’t quite what I was expecting, but it was a refreshing change of pace.